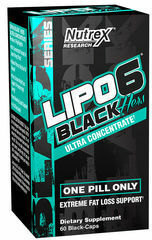 LIPO-6 BLACK HERS contains clinically validated Advantra Z that is proven to help increase your metabolic rate. To change your body composition it is essential that you speed up your body’s metabolic activity. The unique proprietary formula of LIPO-6 BLACK HERS was developed to support this process through different physiological pathways.